Written by Charles-Henri Gros, Liana Hadarean, and Mandar Satam. Since this article was posted, we have made several improvements to our capability of detecting code patterns vulnerable to Spectre. Details on the latest enhancements can be found here. In the last few months, Spectre (CVE-2017-5753 and CVE-2017-5715) has emerged as a new kind of vulnerability. In the interest of helping the development community actively defend against these exploits, the Synopsys Software Integrity Group is releasing a checker that can identify code patterns that are vulnerable to the Spectre attack. We examined what kinds of code Spectre can exploit and how static analysis can help detect them. In this article, we’ll discuss some real-world examples we found and share techniques for mitigating the effects of Spectre. First, let’s take a brief look at a couple of concepts necessary to understand the Spectre vulnerability. Readers familiar with the details of the Spectre vulnerability (branch prediction, speculative execution, and cache timing attacks) can skip to the “Using static analysis” section below. When the processor comes across a conditional branch instruction, it tries to predict which branch will be executed. Its prediction is based on many factors, such as the range of values used in the condition, the history of previously executed instructions, and the number of times the branch was executed in the past. One might assume that val = array1[x] gets executed only if x is less than array1_size. However, if the value of array1_size is not in the cache, the processor must wait until the value is read from the main memory, which takes significantly longer. Instead of being idle, the processor may predict that the condition is true and speculatively execute the body of the if-statement, even if x is outside array1’s bounds. The Spectre vulnerability relies on the fact that speculative execution can affect the cache state. Cache timing attacks are used to determine whether a value is in the cache by measuring how long it takes to read from a memory address. If the value is in the cache, the read will be fast, and if not, it will be slow. An attacker can populate the cache with their own data by reading a very large array, and then run the victim’s code that accesses sensitive information. To load its own data into the cache, the victim’s code must evict some of the attacker’s data. The attacker can now run their own code again and, by timing memory accesses, infer what memory locations the victim has accessed. Prime and probe and flush and reload are well-known cache timing attacks used as data extraction mechanisms in the Spectre attacks. Spectre is an information leakage vulnerability that uses the speculative execution and data caching mechanisms of the processor to extract sensitive data from the victim process. Recall that speculative execution based on branch prediction can cause updates to the data cache. If the predicted branch is not taken, the processor discards the output from the registers as well as other state information but does not discard the updates to the cache. An attacker can exploit this by mistraining the processor to take the wrong branch and then use the fact that the result of that speculative execution stays in the cache to extract the sensitive data. There are two variants of this attack technique: variant 1, bounds check bypass (CVE-2017-5753), and variant 2, branch target injection (CVE-2017-5715). In this post, we’ll focus on variant 1 because it’s easier to exploit. It relies on a more commonly occurring pattern in user- and system-level C/C++ programs compared to variant 2. Let’s assume that the attacker has managed to mistrain the branch prediction algorithm to expect the if-condition to be true. The attacker then provides a maliciously chosen value for x that is outside the bounds of array1 such that array1[x] points to sensitive data. Since array1_size is not cached, the processor must wait for array1_size to be read from the main memory; meanwhile, it will speculatively execute the array2[array1[x]*256] memory read. Since array2 also is not in the cache, the read will update a cache location that depends on the array1[x]*256 value. Once the processor finishes the load of array1_size, it will roll back the speculative execution, but the change to the cache state will remain. The attacker can use cache timing attacks to observe which cache location changed during speculative execution and thus infer the value of array1[x]. By varying the value of x, the attacker can thus infer the value at any memory location in the victim process. 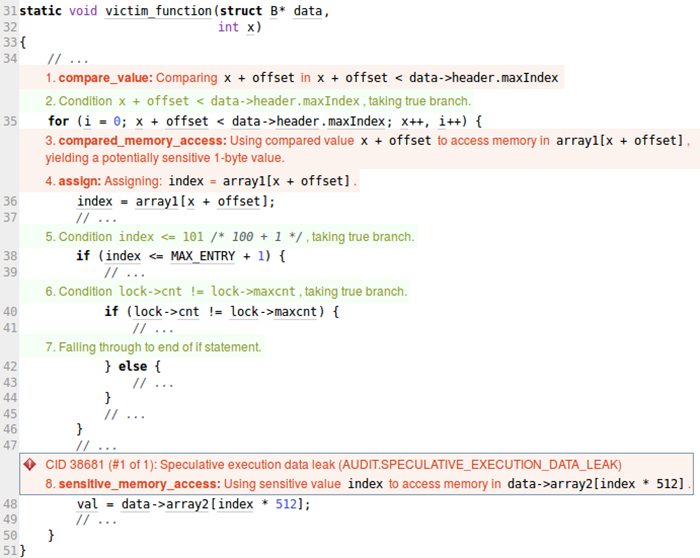 Next, let’s see how static analysis can help detect code vulnerable to the Spectre attack. To help mitigate the effects of the Spectre attack, we have extended the Coverity static analysis tool to identify code instances that may be vulnerable to the bounds check bypass variant of Spectre. Our goal is to provide development teams with a checker that efficiently identifies exploitable code patterns without overwhelming the user with too many defect reports. We worked with development teams from prominent hardware vendors, as well as kernel developers, to make sure the analysis results were meaningful and useful. A particularly challenging task is deciding whether a value can be attacker controlled. While Coverity has taint tracking capabilities, doing this precisely would be slow and would require modeling of APIs that could yield user-controllable data. For this reason, we do not check whether the index value can be controlled by an attacker. It’s left to the developer’s discretion to examine the potentially vulnerable locations reported by the tool and decide whether the index is user-controllable. We ran the Coverity AUDIT.SPECULATIVE_EXECUTION_DATA_LEAK checker on several real-life codebases. Recall that the checker doesn’t guarantee that the code is exploitable. Rather, it’s meant to flag problematic code patterns. It’s up to the developer to examine the defect report and decide the appropriate remediation. In our experiments, the checker reported on average 1 defect for every 35,000 lines of code. This is significantly less than the total number of branching instructions in the code and a manageable number of defects for developers to examine. If the x parameter to victim_function can be controlled by an attacker, the code is potentially vulnerable to the bounds check bypass variant of Spectre. x + offset is compared to data->header.maxIndex on line 35. Assuming the attacker can mistrain the branch predictor, the array access on line 36, index = array1[x + offset], would be speculatively executed even if x + offset is out of bounds. This could lead to sensitive data being stored in the index variable. Recall that an attacker cannot access it directly but must use it as an index to access memory. index is later used as an index on line 48: data->array2[index * 512]. If the attacker can ensure that data->array2[index * 512] is not in the cache, the cache location corresponding to the sensitive value index will be updated. Using cache timing attacks, the attacker may be able to retrieve part of the sensitive data. Identifying the vulnerable code is only half of the job. Figuring out the correct way to protect against the effects of the attack is equally important. But adding an _mm_lfence()instruction after every conditional branch would result in impractical slowdowns. Therefore, it’s important to add these instructions only to code that is vulnerable to Spectre. The Coverity AUDIT.SENSITIVE_DATA_LEAK checker addresses this need by helping developers find these vulnerable code patterns. For the latest updates to the AUDIT.SPECULATIVE_DATA_LEAK checker, see the following blog post. This post is filed under Software Architecture and Design, Static Analysis (SAST).